This year's excavation in the shadow of the Great Pyramid is now complete, and has turned up tantalizing new clues about the workers who built these great monuments, and the royal families for whom they were built. In previous years, Lehner had found the remains of bakeries and possible fish processing plants, that may have helped feed a massive workforce, perhaps as large as 20,000 people. 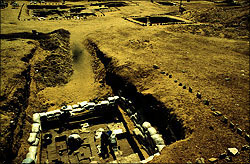 It would probably take a workforce that size to completely excavate this site; from the series of small 5 by 5-meter "windows" the archaeologists have excavated, they believe they have found an enormous building complex, laid out in a rectilinear pattern and orientated to the cardinal directions. This is a building pattern that in and of itself suggests royalty. This year the team returned to look for more signs of the workers, and for the missing palaces of the Old Kingdom, which should logically be somewhere near the Pyramids of Giza. The first sign of progress came—not with the dramatic find of a single object—but with the painstaking analysis of material excavated from the site in previous field seasons. Contained within the sifted material were the remains of a significant number of young male cattle. Cattle are more expensive to maintain than other types of meat, and so are generally presumed to be the food of the wealthy. Plant remains were also found—but none of the chaff or weeds normally associated with cleaning—suggesting that costly, processed cereal grain was being delivered in large quantities to the site. In essence, the archaeologists were digging through what they called "the garbage of an expensive way of life." While the analysis of food remains continued throughout the season, other team members followed the outlines of the mudbrick walls and methodically excavated grid-like areas, which they call "squares." Bread molds like those found in previous seasons were again found in abundance, but this time, fascinating new evidence for other types of craft work were also uncovered. In one "square," the archaeologists found copper slag—evidence of copper working—and in another they found yellow and red pigment and hammerstones, which may have been used for grinding pigment to make paint. Toward the end of the field season, the archaeologists came upon the outlines of what looked like a small modular house, similar to those found in workmen's towns at other sites from later periods. The structure was built in an extremely simple house plan, with two main rooms. One room contained a platform, and the other contained large quantities of ash on what may have been a simple hearth. 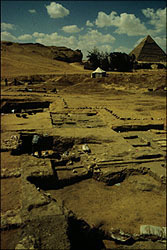 Finally, the archaeologists continued to excavate the thick mudbrick wall to which the bakeries are attached, a wall which they suspect to be part of the Palace of Menkaure. 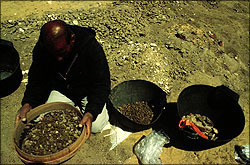 While they were working they found even older remains, including a few seal impressions of the pharaoah Khafre, believed to be Menkaure's father. Lehner said this raised the "daunting" possibility that "the ruins of another whole complex lie below the one we have been clearing so far." The exploration of this possibility, and the search for the missing palaces of the Giza pyramid kings, will be their targets next year when the archaeological team returns to Egypt. See Mark Lehner's full report on the 1997 field season.